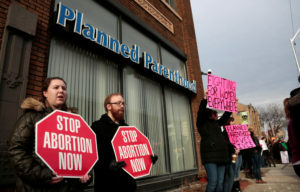 IOWA CITY, Iowa — Republicans who control a majority of the nation’s statehouses are considering a wide range of abortion legislation that could test the government’s legal ability to restrict a woman’s right to terminate pregnancy. Republican-controlled states have passed hundreds of bills since 2011 restricting access to abortion while Democratic-led states have taken steps in the other direction. The Mississippi House passed a bill Friday that would make the state the only one to ban all abortions after 15 weeks of pregnancy. In Missouri, lawmakers heard testimony earlier in the week on a bill that would ban abortions after 20 weeks. The Ohio House is expected to consider bills, already passed in the Senate, that would prohibit the most common type of procedure used to end pregnancies after 13 weeks and require that fetal remains be buried or cremated. Abortion is a perennial hot button issue in statehouses across the country. Republican-controlled states have passed hundreds of bills since 2011 restricting access to the procedure while Democratic-led states have taken steps in the other direction. The early weeks of this year’s state legislative sessions have seen a flurry of activity around the issue. It comes as activists on both sides say they expect the U.S. Supreme Court to soon consider a question that remains unclear: How far can states go in restricting abortion in the interest of preserving and promoting fetal life? The state bills debated since the start of the year “are all tests designed to see how far government power to legislate on behalf of a fetus can reach,” said Jessica Mason Pieklo, who has been tracking legislation as the senior legal analyst for Rewire, a website that promotes views supporting abortion rights. She said the outcome will determine whether states can legally ban abortion after a specific time period and outlaw specific medical procedures. Advocates for abortion rights say those strategies undermine the Supreme Court’s 1973 ruling that women have the right to terminate pregnancies until a fetus is viable. In Utah, critics have warned that a pending bill to prevent doctors from performing abortions on the basis of a Down syndrome diagnosis is unconstitutional. But its co-sponsor, Republican state Sen. Curt Bramble, said he is willing to defend the bill in court because its goal is to protect unborn children. “There are times if the Supreme Court got it wrong, it is appropriate to push back,” said Bramble, an accountant from Provo. The anti-abortion bills have drawn opposition from women who say they have made the excruciating choice to terminate a pregnancy, often after discovering serious fetal abnormalities. Utz recounted terminating her pregnancy in its 21st week in November 2016, after learning her daughter would be born with a fatal kidney disease if she survived birth. She said doctors told her that dilation and evacuation, the most common abortion procedure in the second trimester, was the safest way to terminate the pregnancy. Several court challenges to both types of laws are underway, with federal appeals courts considering the “dismemberment abortion” bans approved last year in Texas and Arkansas. The Kansas Supreme Court is expected to rule soon on the first-in-the-nation ban passed in that state three years ago. Ingrid Duran, director of state legislation at the National Right to Life Committee, said the model state laws drafted by her group are aimed at U.S. Supreme Court Justice Anthony Kennedy, a swing vote who wrote the court’s 2007 opinion upholding a federal ban on a procedure critics call partial-birth abortion. She said the court could use similar reasoning to prohibit dilation and evacuation and noted it has never considered whether states have an interest in protecting fetuses from pain. “We did draft these laws with the bigger picture in mind,” Duran said. The shifted focus comes after the court dealt the anti-abortion movement a blow in 2016 by ruling that strict Texas regulations on abortion clinics and doctors were an undue burden on abortion access and unconstitutional. Anti-abortion groups hope President Donald Trump will be able to nominate one or more justices to the Supreme Court following last year’s confirmation of Neil Gorsuch, potentially making the court more conservative on the issue for decades to come. In the meantime, some of them are cautioning their allies not to go too far. Duran said the proposed 15-week ban in Mississippi, which now goes to the state Senate, caught her by surprise. She noted that prior state laws banning abortion after 12 weeks or once a heartbeat was detected have been found unconstitutional. In South Carolina this past week, state senators tabled a bill that would have banned most abortions to give lawmakers more time to study the consequences. Also last week, a legislative committee in Tennessee amended a bill to remove language that would have outlawed abortion once a fetal heartbeat is detectable, which is usually around six weeks. The bill’s sponsor, Republican Rep. Micah Van Huss, said he would be back. “I will not stop fighting for the lives of babies until abortion is abolished in this state,” he said. AP reporters Julie Carr Smyth in Columbus, Ohio, and Brady McCombs in Salt Lake City, Utah, contributed.